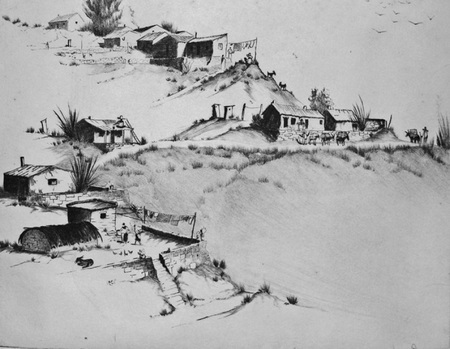 Writer and illustrator Ellis Credle Townsend moved from Guadalajara to Ajijic in about 1974 and lived and worked at Lake Chapala for more than a decade. She was the author and illustrator of more than twenty children’s books over a long career. 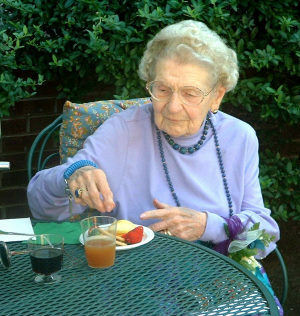 Ellis Credle (she used her maiden name on all her books) was born and raised in North Carolina. 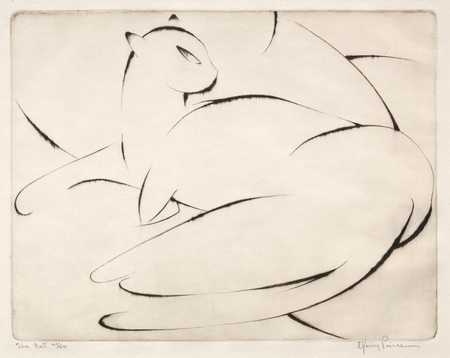 Born in 1902, she studied at Louisberg College and taught high school in the Blue Ridge Mountains before moving in 1926 to New York City, where she studied interior design and took painting classes at the Art Students League. She worked as a governess for two children before landing a commission to draw reptiles for the American Museum of Natural History. While continuing to write in her spare time, she was also asked to paint a series of murals for the Brooklyn Children’s Museum. 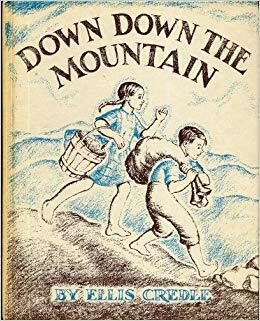 She had several rejections from publishers before one finally accepted Down Down the Mountain (1934), the first ever illustrated children’s book set in the Blue Ridge country. Helped by her deep familiarity with the area’s folk tales and life styles, it was an immediate success and quickly became a classic; it sold more than 4 million copies. Credle visited Mexico in the early 1930s and another of her early books, Pepe and the Parrot (1937), a story about a dog and a parrot, was set in a traditional Mexican village. 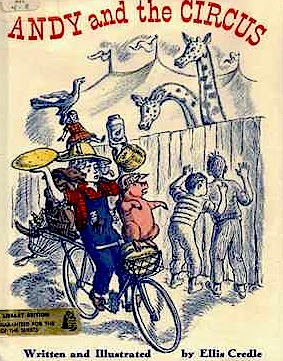 Other books Credle published before moving to Mexico include Across the Cotton Patch (1935), based on her childhood days on a grandfather’s farm; Little Jeems Henry (1936); That Goat That Went to School (1940) and Janey’s Shoes (1944). Credle married Charles de Kay Townsend; the couple had one son. Born in Rhode Island, her husband was a Harvard graduate and served in the Navy during the second world war. He was a photographic technologist with the National Gallery of Art in Washington, D.C. for many years, and it was after he retired that the couple left for Mexico with their young son, Richard, in 1947. Her husband’s photographs were used in some of Credle’s later books. Richard grew to love Mexico and became an eminent authority on pre-Columbian cultures. He gained a masters degree in anthropology form the University of the Americas and a doctorate from Harvard for work on the art of Tenochtitlán. He was curator of the Department of Africa, Oceania, and the Americas at The Art Institute of Chicago, and edited numerous exhibition catalogs including The Ancient Americas: Art from Sacred Landscapes and Ancient West Mexico (which has many close links to the Lake Chapala area). The family arrived in Mexico planning to stay only six months so that Credle could write without distraction, perhaps to put the finishing touches to My Pet Peepelo (1948), a story set in Mexico. Here Comes the Showboat was published the following year. By then, the Townsends had settled in Zapopan, Guadalajara, where their stay kept being extended by other book commissions; Credle ended up living in Mexico for more than 40 years. Even in so-called retirement, Credle continued to write and based several more stories in Mexico, though none ever received the same high praise as her tales of the Blue Ridge country. In 1964, she and her husband were commissioned by Nelson to write a school book about Mexico, aimed at young teenagers. This was published in 1968 as Mexico, land of hidden treasure in Nelson’s World neighbors series. Following the death of her husband in 1974, she moved to La Floresta in Ajijic on Lake Chapala. Late in life she also wrote “Dog Ignacio Lives On“, a short piece published in El Ojo del Lago, November 1994. Ellis Credle Townsend was often asked to lecture in the U.S. on account of her knowledge of authentic folklore and was a regular at the Ajijic Writers’ Group. Interviewed for El Ojo del Lago late in her life, Credle said, “I have never regretted coming to Mexico. I have always felt happy, at home, and strangely safe here.” She did not travel very far apart from occasional trips to Chicago to visit her son. She was in Chicago at the time of her death on 21 February 1998. Guadalajara Reporter: 2 April 1964: 1 Oct 1964. 1996; reproduced March 2015 issue. Richard Walser. 1960. Entry for Ellis Credle in Picturebook of Tar Heel Authors. Raleigh, N.C.: State Department of Archives and History. Dorothy Bastien, a writer of juvenile fiction, and her husband Clarence Bastien appear to have lived in Chapala for about a decade in the 1970s. A brief note in the Guadalajara Reporter in 1972 says that Dorothy, living in Chapala, has just received an advance for a book accepted by the Teenage Book of the Month Club. 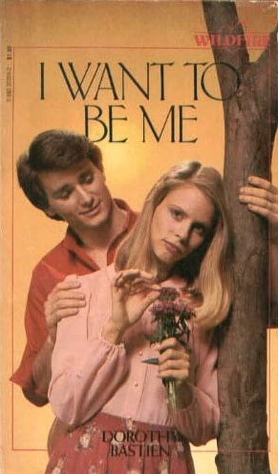 The book in question must be Lori, published in New York by Scholastic later that year. Lori, her first book to be accepted for publication, is about a 17-year-old girl who is forced to spend the summer with her estranged father in Mexico while her boyfriend is back home in Texas. 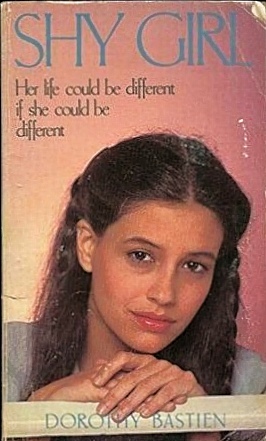 Dorothy Bastien also wrote several other books: Westward to Destiny (1973), an historical account of Missouri and Oregon in the early and middle 1800s; The Night Skiers (1974); Shy Girl (1980); Remember to Love (1980); and I Want to Be Me (1981). She had previously written several articles and stories, including “Friendly Harvest”, published by The Country Home Magazine in 1936. The Bastien’s family home was at 7665 SW Oleson in the Portland neighborhood of Garden Home. Don Krom, a nephew of Dorothy Bastien, contributed to the Garden Home History Project with recollections of life there in the 1950s that shed some light on the kind of literary and intellectual circle in which the Bastien family grew up. Don recalls that Dorothy Bastien was in a writing group that met in Garden Home and included some well-known personalities: L. Ron Hubbard (founder of Scientology) who was better known at that time for writing science fiction; Peg Bracken, author of humorous books on etiquette cooking, such as The I Hate to Cook Book; and Charlotte Goldsmith who wrote stories about war and planes for the Saturday Evening Post and other publications. 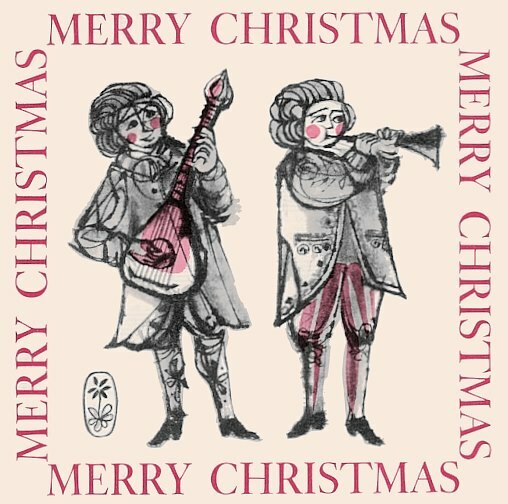 Dorothy Bastien’s husband, Clarence, was musical and a violinist (and quite possibly also a high school teacher). The Bastiens’ son James (1934-2005) became a professional pianist and educator who, with his wife Jane, wrote more than 300 books related to piano playing that have been used by millions of piano students, including the series Bastien Piano Library, Bastien Piano Basics and Music Through the Piano. Their books have been translated into 15 languages. It is unclear when the Bastiens moved to Chapala, though Dorothy Bastien is recorded as taking a flight from Guadalajara to Mexico City in July 1968. Further details related to Dorothy and Clarence’s time in Chapala have not yet surfaced but it appears that they lived there from about 1970 until Clarence’s death on 5 July 1980, of respiratory failure, at the couple’s home (5 de Mayo #224). Clarence was interred in the local cemetery. Dorothy later moved to La Jolla, California, where she passed away on 19 May 1985, at the age of 79. New York Times. 2006. “James Bastien” (obituary). New York Times, 29 January 2006. The News Leader (Staunton, Virginia): 6 Nov 1963, p 5. Valley Morning Star (Harlingen, Texas), 25 Oct 1974, p 23. Don Krom. 2017. “Dorothy McNamara Bastien and her writing group in Garden Home in the 1940s“. Posted at website of Garden Home History, 9 April 2017. Poet and children’s novelist Aileen Olsen and her second husband Arthur Melby first lived at Lake Chapala from 1970 to 1973 and then retired there in 1986, remaining there for the rest of their lives. Aileen Bertha Olsen, also known as Aileen Olsen Molarsky and Aileen Olsen Melby, was the daughter of Norwegian immigrants to the U.S.. Born in the Upper Peninsula of Michigan on 24 October 1921, she attended Escanaba High School and won a full scholarship to the School of Arts and Architecture at the University of Michigan, Ann Arbor. After graduating from university, Olsen moved to Greenwich Village in New York City, to work as a commercial artist. Her first job was with Women’s Wear Daily, after which she became art director for the book department of The Reader’s Digest. She was still working for The Reader’s Digest at the time of her first marriage, to Osmond Molarsky in New York City, on 22 December 1951. The couple initially lived in New York City, at 5 West 65th St., before moving to Westport, Connecticut. They were avid sailors and enjoyed exploring the U.S. East Coast and the Caribbean. The couple, who divorced in 1965, had no children. 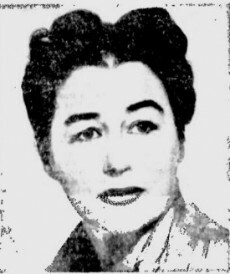 At some point following her divorce, Aileen Olsen Molarsky moved to San Francisco where she worked for the architectural division of the Pebble Beach Company, and met and married Arthur Melby. Arthur Melby (1917-2010) had been a forester in Montana and had worked in the FBI during the second world war as an undercover intelligence officer, before establishing box factories in Guatemala and El Salvador. Prior to retiring to Ajijic in 1986, the Melbys lived in the Carmel Valley of California for about twenty years. 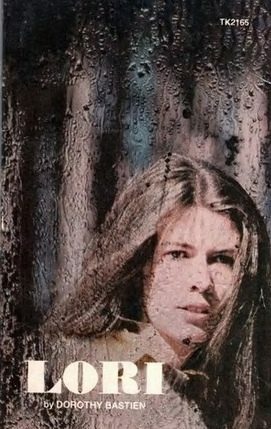 An example of Aileen Olsen’s work was also included in the anthology Golden Treasure: Catch A Spoonful, published by Scott, Foresman and Company in 1976. Poems by Olsen were included in Poetry Shell, a quarterly poetry journal published on the Monterey Peninsula in Carmel, California. Aileen and Arthur Melby first visited Ajijic in 1970 when they stayed in the village for three years. After retirement, they moved there in 1986 and remained there the rest of their lives. They were active in the local community and staunch supporters of the Lake Chapala Society: Arthur was its President from 1989 to 1992, and Aileen later donated her entire library to the Society. In 1991, Aileen Olsen Melby, who was also an accomplished watercolor painter, wrote and published Song for Mexico, a 60-page book of poems with decorative illustrations by Jorge Encisco. Aileen Olsen Melby suffered from Alzheimer’s disease in later life and died on 12 August 2003, predeceasing her husband by seven years. Barbara Strong used her maiden name of Barbara Nolen professionally, as an author and editor of children’s books. Strong was born on 19 December 1902 and died at Cape Cod, Massachusetts, on 13 December 2002, less than a week shy of her 100th birthday. She and her husband David Strong lived in Morris, Connecticut, and in Washington D.C. (where they lived in “an old, antique-furnished eight-room house” in American University Park), but also kept a weekend home in West Virginia. In their retirement years, they regularly wintered at Lake Chapala, where Barbara became especially active in supporting the Niños y Jovenes children’s home in San Juan Cosalá. Barbara Strong graduated from Smith College in 1924, studied at Columbia School of Journalism in the summer of 1924, and received her MA from Stanford University in California in 1925. She first met her husband, David Fales Strong, at the Grand Canyon in 1924, when they were both on their way to do graduate work at Stanford. They married on 14 June 1927 in Vienna, Austria, and had a year-long honeymoon traveling around Europe. The couple had two children: Stephen Lewis Strong and Deborah Louisa Strong MacKnight. David Fales Strong (1899-1987) was the author of Austria (October 1918-March 1919): Transition from empire to republic, published by Columbia University Press in 1939. Barbara Strong had a long and successful career in children’s publishing. From 1925 to 1944, she was an editor of children’s books for Macmillan, Century Publishers and several other publishers. In total, she edited more than 500 books ranging from fiction to biography and animal stories and was a regular contributor of book reviews to the New York Times, the New York Herald Tribune, the Washington Star and several other papers. In the 1930s and 1940s, Strong was a consultant to the CBS Radio program, “The American School of the Air”. She taught workshops in Children’s Literature at George Washington University and the American University in Washington D.C., and gave seminars on “Writing for Children” for teachers from overseas. Strong co-founded the Children’s Book Guild of Washington, D.C. and was actively involved in lobbying for special legislation to be passed creating school libraries for Washington D.C. schools. After retirement, Barbara traveled frequently to Mexico and became an early member of the Asociación de Amigos de Ninos y Jovenes, which provided local support for a children’s home in San Juan Cosalá. Strong established a U.S. and Canadian fund-raising group called Friends of Ninos y Jovenes to help the home. Barbara Strong’s first trip to Lake Chapala seems to have been in about 1971. The Guadalajara Reporter for 6 March 1971 reported that “Mr and Mrs David Strong, who write juvenile books” were visiting Chapala while undertaking research for a Mexican anthology, before continuing on to Guanajuato and Mexico City. This anthology was Mexico is people : land of three cultures (1973), for which Concha Romero James wrote the introduction. James, also an author, was head of the division of cultural relations of the Pan-American Union (later the Organization of American States) and responsible for the formation of its visual arts program. In addition to her book about Mexico, Strong compiled or edited numerous books, including Children of America (1939); The Brave and Free (1942); Merry Hearts and Bold (1942); Fun and Frolic (1947); Luck And Pluck (1950); Do and Dare (1951); What Next? Adventure and Surprise (1957); Spies, spies, spies (1965); Africa is people : firsthand accounts from contemporary Africa (1967); Ethiopia (1971); Africa Is Thunder and Wonder: Contemporary Voices from African Literature (1972); Voices of Africa (Fontana modern novels, 1974); The Morris Academy – Pioneer in Co-education (1976). Documents and papers relating to the life and work of Barbara Nolen Strong reside in the Special Collections of the University of Oregon (Barbara Nolen papers, 1937-1974) and in the Litchfield Historical Society, Litchfield, Connecticut. Anon. 2002. “Barbara Nolen Strong, 99, W. Yarmouth resident, editor, consultant, library advocate.” Cape Cod Times. 20 December, 2002. Hazel Emma Wilson, a prolific author of children’s books, visited Lake Chapala in 1971, “doing research for a Mexican book”. At that point in her career she had already written 19 books. 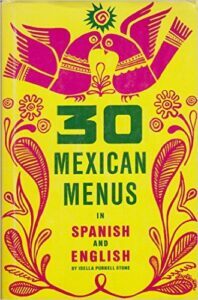 Unfortunately, it remains maddeningly unclear whether or not any book based on her Mexican research was ever published! Wilson (née Hutchins) was born in Portland, Maine, on 8 April 1897 (some sources claim 1898). She earned her AB from Bates College in Lewiston, Maine, in 1919 and a B.S. in Library Science from Simmons College, Boston, Massachusetts, in 1920. She worked as a librarian in various educational institutions: Portland High School, Maine; Kirksville State Teacher’s College, Missouri; Bradford Academy, Massachusetts; the American Library in Paris, France (1926-1928); and was supervisor of school libraries in Denver, Colorado. She married Dr. Jerome William Wilson (1884-1963) and settled in Washington D.C. in 1930. Their son, Jerome Linwood Wilson, was born in 1931. He went on to become a member of the New York State Senate (from 1963 to 1966) and the Political Editor of the TV station WCBS-TV. Hazel Wilson is best known for her series of stories about Herbert, a 10-year-old whose antics were based on the real-life experiences of her son and his friends. Wilson was also a lecturer at George Washington University, Washington, D.C. (1956-1957) and taught at one time at Georgetown University. For some years, she wrote monthly reviews for the now defunct Washington Evening Star newspaper. She was a founder of the Children’s Book Guild of Washington and a member of the American Newspaper Women’s Club and Women in Communication. 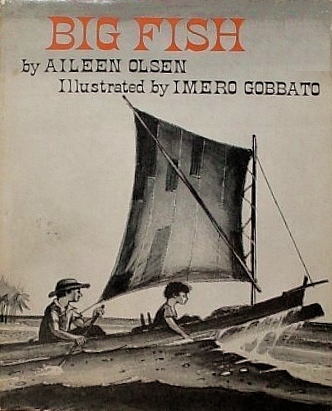 Wilson’s books include The Red Dory (1939)-her first book for children; The Owen Boys (1947); Island Summer (1949); Herbert (1950); Thad Owen (1950); The Story of Lafayette (1952); The Story of Mad Anthony Wayne (1953); More Fun with Herbert (1954); His Indian Brother (1955); The Little Marquise: Madame Lafayette (1957); Tall Ships (1958); Jerry’s Charge Account (1960); Herbert’s Homework (1960); Herbert Again (1962); The Seine River of Paris (1962); The Last Queen of Hawaii: Liliuokalani (1963); The Years Between: Washington at Home at Mount Vernon, 1783-1789 (1969); Herbert’s Stilts (1972); and Herbert’s Space Trip (1973). 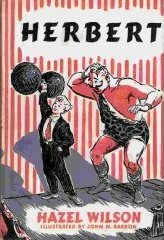 Among other honors, Wilson won the Ohioan Award for Island Summer (1949); the Boys’ Clubs of America Junior Book Award for Thad Owen (1950); the Edison Award for His Indian Brother (1955); and the 1955 New York Herald Tribune Spring Book Festival Honor Award for Herbert. Hazel Wilson died in Bethesda, Maryland, on 20 August 1992. Hazel Wilson Papers, University of Maine. Guadalajara Reporter. 6 March 1971. Washington Post. 1992. Hazel E. Wilson dies. Washington Post, 21 August 1992. Explanations of why the famous British author D. H. Lawrence chose to visit Chapala in 1923 often ignore the key role played by Idella Purnell, a strong-willed young poetry fanatic from Guadalajara. 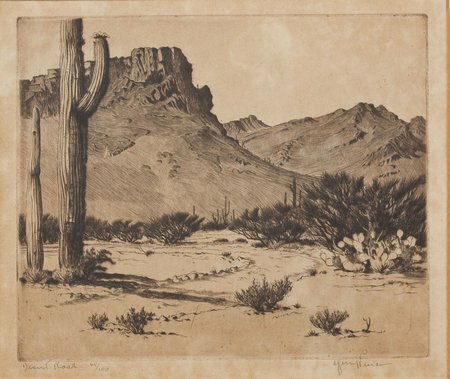 Purnell had studied under American poet Witter Bynner at the University of California, and Bynner had received an open invitation to visit Purnell and her family in Guadalajara. Over the winter of 1922-23, Bynner and Lawrence had become friends during the English author’s first stay in New Mexico. In 1923, Lawrence was becoming restless and proposed a trip to Mexico. Lawrence and his wife Frieda invited Bynner, and Bynner’s secretary-companion Willard “Spud” Johnson (who had been a fellow student of Purnell in Bynner’s class), to accompany them. After a short time in Mexico City, the group settled in Chapala for the summer, during which time they met frequently with Idella Purnell and her dentist father, Dr. George Purnell, sometimes in Guadalajara, sometimes in Chapala. 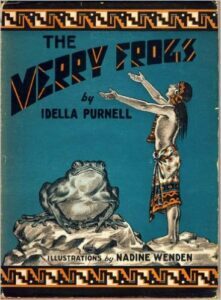 The Purnells had numerous links to Chapala and Ajijic (where Dr. Purnell owned a small house), and Idella Purnell went on to enjoy considerable success as a poet, editor, and author of children’s books. [Born on 28 March 1863, Purnell’s father, George Edward Purnell (1863-1961), was among the earliest graduates in dentistry from the University of Maryland, the first dental college in the U.S. Purnell practiced in Missouri before moving to California. In 1889, during a downturn in the Californian economy, a vacation trip to Mexico became a permanent move. Idella, the eldest of the Purnell’s three children, was born in Guadalajara on 1 April 1901, and named after her mother. As a teenager, she taught primary school in Guadalajara before attending the University of California, Berkeley. During her second semester there, she was the youngest student in a poetry class given by Witter Bynner. She also became an associate editor of The Occident, the university’s literary magazine. 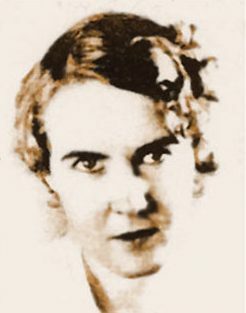 Taking advantage of her connections to the Berkeley poetry circles, Purnell spent much of 1922 planning the first issue of Palms, a small poetry magazine that she would edit and publish until 1930. The first issue of Palms appeared in the spring of 1923, just before her prayers for further intellectual stimulation were answered by the visit of Bynner, Johnson and Lawrence. 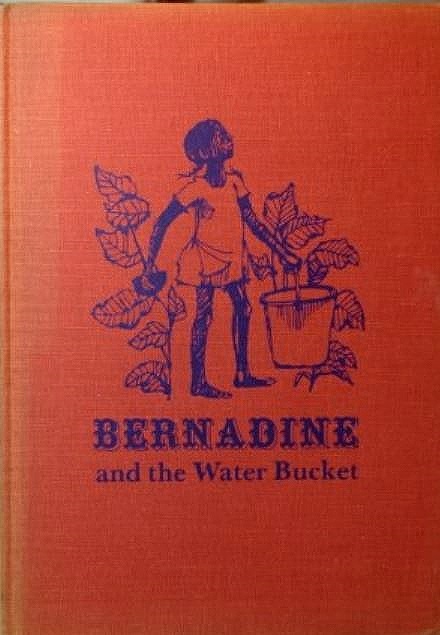 Bynner had been supportive of Palms from the start, but had certainly not anticipated Lawrence’s willingness to offer some poems and drawings, in exchange for some home-made marmalade. “Never have I seen Lorenzo [Lawrence] more amiable, more ingratiating that he was that evening. He listened to poems of Idella’s and to some of her Palms material. He was full of saintly deference to everyone…” (Journey with Genius, 82). Over the next few months, the Purnells saw Lawrence regularly, either at their home in Guadalajara, or in Chapala at weekends when they stayed Saturday nights at the Hotel Arzapalo. In early July, a few days before the Lawrences left Chapala, they arranged an extended four‑day boat trip around the lake with Idella Purnell and her father. The group left Chapala aboard the Esmeralda on 4 July. 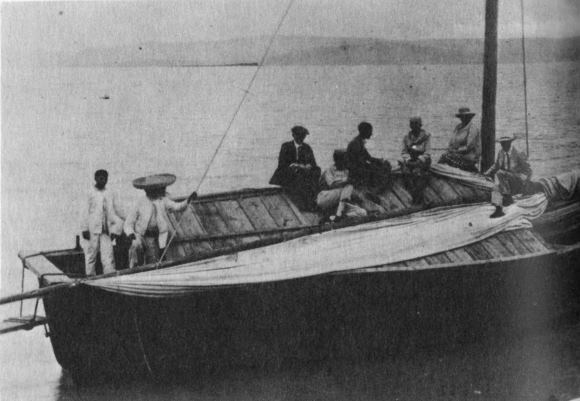 The Esmeralda boat trip, 1923. Photo credit: Willard Johnson. The boat ran into very bad weather overnight, causing several of the group to be sick, before they finally limped into shore on the south side of the lake near Tuxcueca. From there, Idella took a badly-suffering Bynner back to Chapala on the regular steamer. While friends accompanied Bynner to a hospital in Guadalajara, Idella remained in Chapala to greet the remaining members of the party when they finally returned a few days later. Based on these times with Lawrence and his friends in Chapala, Purnell wrote an unpublished roman à clef novel entitled Friction. The novel, whose title was suggested by Lawrence, apparently incorporates some excellent descriptions of the local area, and revolves around a political assassination. Among the characters are Edmund (Lawrence), Gertrude (Frieda), Judith (Idella), Lionel (Johnson) and Dean (Bynner). 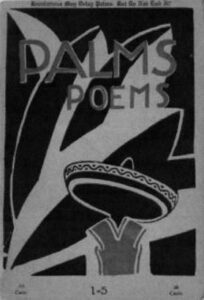 Purnell continued to publish and edit Palms, considered a forum for young, upcoming poets, until 1930. She never published any of her own poems in Palms, but under her leadership, the magazine published work by more than 350 poets, many of them rising stars at the time, even if largely forgotten since. Palms included contributions from Bynner, D.H. Lawrence, Johnson, Marjorie Allen Seifert, Warren Gilbert, Mable Dodge Luhan, Countee Cullen, Norman Maclean, Carl Rakosi, Langston Hughes and Alexander Laing, among others. Both Lawrence, and his Danish artist friend Kai Gøtzsche (1886‑1963) (see image) provided illustrations for Palms‘ covers, as did Idella’s younger sister Frances-Lee Purnell. Famous American poet and critic Ezra Pound, in his essay “Small Magazines” (1930), said that Palms “was probably the best poetry magazine of its time”, high praise indeed. During the second half of the 1920s, Purnell yo-yoed between Mexico and the U.S. In summer 1925, she was head of the foreign book department at the Los Angeles Public Library, where she first met future husband, John M. Weatherwax, before moving back to Mexico in October. In 1927, Purnell and Weatherwax married, and she joined him in Aberdeen, Washington. She returned to Guadalajara the following year to have their only child, a daughter who, tragically, died as an infant. Weatherwax sued for divorce in 1929, but despite this, he and Purnell collaborated on 19 books between June 1929 and October 1930. She gave up publishing Palms in 1930. The title was briefly revived by Elmer Nicholas in 1932, a minister in Frankton, Indiana. On a business trip to New York in 1930, Purnell fell in love with Remington (“Remi”) Stone. 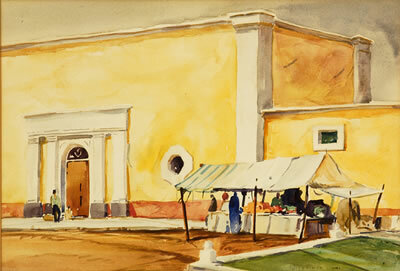 The couple lived in New York and married in Tlaquepaque, Jalisco, on 30 September 1932. In 1931, Purnell returned once again to Guadalajara, and the following year was the organizer and dean of the first University of Guadalajara summer session. Many years later, in 1975, her photograph appeared in the Guadalajara Colony Reporter as a guest of honor at ceremonies marking the 50th anniversary of the founding of the University of Guadalajara, since she had been the University of California’s delegate to the university’s opening in 1925. Purnell had two children with Remington Stone: Marijane Stone, born in 1934, and Remington, born in 1938. The couple also later brought up Purnell’s niece, Carrie Stone. In 1935, when Marijane was only 14 months old, the family began another Mexican gold-mining venture. Remi remained in New York to secure financing, while Idella and Marijane joined Dr. Purnell in Ameca, Jalisco, to oversee the mining operations. All three became ill, so Remi arrived to help run the mine. In 1937, Idella and Marijane went to Los Angeles for medical reasons. Remi gave up the mine shortly afterwards when the Mexican government began expropriating foreign-owned mining property. In Los Angeles, Idella taught creative writing, and during World War II, she became a riveter for Douglas Aviation and Fletcher Aviation. In the 1950s, she started studying dianetics, and opened a Center for Dianetics in Pasadena in 1951, before moving it to Sierra Madre in 1956. 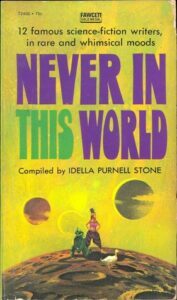 Purnell died in Los Angeles, California, on 1 December 1982; she had played an active role in many different literary and educational achievements of the twentieth century. Her archive of correspondence and papers, 1922‑1960, is held by the University of Texas. 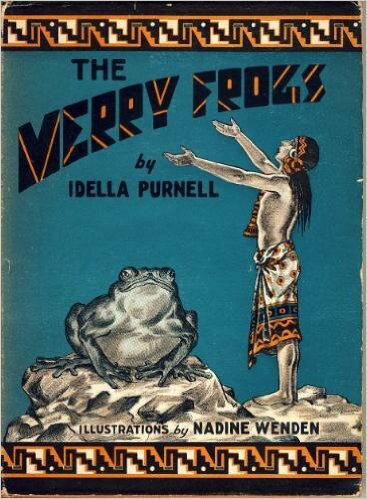 In her long literary career, Idella Purnell (Stone) was the author or co-author of numerous children’s books, including The Talking Bird, an Aztec Story Book: Tales Told to Little Paco By His Grandfather (1930); Why the Bee is Busy and Other Rumanian Fairy Tales Told to Little Marcu By Baba Maritza (1930); Little Yusuf: The Story of a Syrian Boy (1931); The Wishing Owl, a Maya Storybook (1931); The Lost Princess of Yucatan (1931); The Forbidden City (1932); Pedro the Potter (1935); The Merry Frogs (1936). 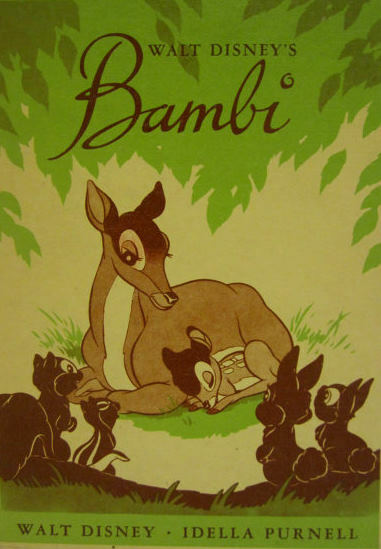 However, Purnell’s best known work is the Walt Disney version of Bambi (1944), when she “retold” Felix Salten’s original version, Bambi, A Life in the Woods, with Disney providing the illustrations. (Incidentally, Walt Disney himself actually visited Chapala at least once; he gave a speech at the Villa Montecarlo in October 1964, during a “De Pueblo a Pueblo” meeting attended by Mexican president Adolfo Lopez Mateos and US military historian John D Eisenhower). In addition to children’s stories, Purnell also wrote non-fiction, including a Spanish language biography of the famous American botanist Luther Burbank: Luther Burbank, el Mago de las Plantas (Argentina: Espasa Calpe, 1955), and 30 Mexican Menus in Spanish and English (Ward Ritchie Press, 1971). Works compiled and edited by Purnell include 14 Great Tales of ESP (Fawcet, 1969) and Never in This World, a collection of stories by twelve famous science-fiction writers, including Isaac Asimov (Fawcett, 1971). Her short pieces include “The Turquoise Horse”, a legend set at Lake Chapala, first published in the Los Angeles Times on 27 December 1925, and “The Idols Of San Juan Cosala“, originally published in American Junior Red Cross News in December 1936. David Ellis. 1998. D. H. Lawrence: Dying Game 1922-1930; The Cambridge Biography of D. H. Lawrence, Volume 3. Cambridge University Press. Edward Nehls (ed). 1958. D. H. Lawrence: A Composite Biography. 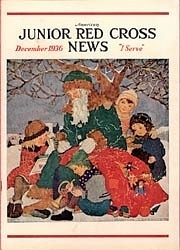 Volume Two, 1919-1925. (University of Wisconsin Press). Vilma Potter. 1994. “Idella Purnell’s PALMS and Godfather Witter Bynner.” American Periodicals, Vol 4 (1994), pp 47-64, published by Ohio State University. Eileen and her second husband Robert (Bob) Bassing, both writers of some distinction, lived in Ajijic between 1950 and 1954. Eileen was born 6 March 1918 in Boston, Massachusetts, and educated in New York, Ohio and California. She married young, at age 16, and had two sons from her first marriage, before marrying Bob in 1948. She died aged 58 in February 1977 in Los Angeles, California. 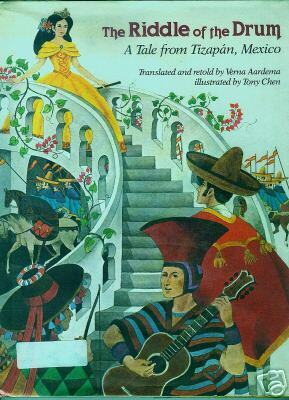 Verna Aardema (1911-2000) was an American author of dozens of children’s books. She has no known connection to Lake Chapala beyond the fact that one of her books, The Riddle of the Drum: A Tale from Tizapán, Mexico (New York: Four Winds, 1979), is connected with Tizapán [el Alto] on the southern shore of the lake. The story, illustrated by Tony Chen, is a translation and retelling of “El Aro de Hinojo y el Cuero de Piojo”, from Tales from Jalisco, Mexico, by Howard True Wheeler, American Folklore Society, 35, 1943. The Riddle of the Drum: A Tale from Tizapán, Mexico can be viewed online via the website OpenLibrary.org: The Riddle of the Drum: A Tale from Tizapán, Mexico (free registration required). The king of Tizapán has a beautiful daughter Princess Fruela. He asks a wizard to make her a special drum. The only man that will be allowed to marry his daughter must first guess what kind of black leather the drum head is made from. Prince Tuzán rises to the challenge, but knows he will forfeit his life if he fails. En route to victory, he gathers around him several unusual characters, all of whom contribute to his success. Verna Aardema (full name Verna Norberg Aardema Vugteveen) was born in New Era, Michigan on 6 June 1911. Even as a child, she wanted to be a writer. She graduated from Michigan State University with a B.A. in Journalism in 1934, before working as an elementary school teacher (1934-1973), later combined with being a local newspaper correspondent for the Muskegon Chronicle (1951-1972). Aardema’s first set of children’s stories Tales from the Story Hat was published in 1960. She started writing for children mainly because her daughter wouldn’t eat until she’d heard one of her mother’s stories. In most stories, the setting was somewhere that Aardema had been recently reading about, such as Africa and Mexico. Her children’s books, based almost always on adaptations of traditional folklore tales, won numerous awards. Why Mosquitoes Buzz in People’s Ears (1975) received the Caldecott Medal and the Brooklyn Art Books for Children Award. Who’s in Rabbit’s House? (1977) was the School Library Journal Best Book of the Year. The author herself received the Children’s Reading Round Table Award in 1981.